1 cup of Navy Beans pre-soaked overnight and simmered for 1 hour until tender. 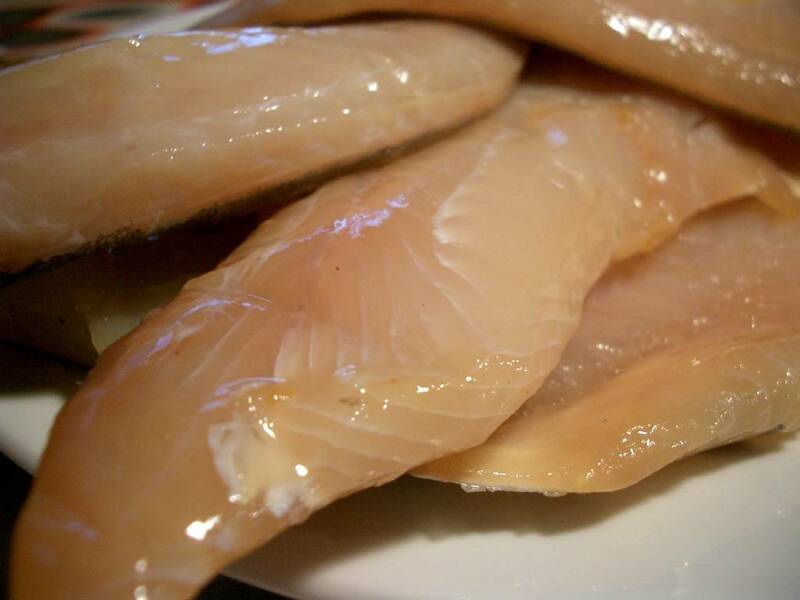 1 beautiful, fresh, piece of undyed smoked haddock. Poach haddock in the milk with bay leaf and plenty of freshly ground black pepper. The fish will be cooked 8 minutes after you turn on the heat. Remove the fish and leave to cool. Add potato and onion to the milk, simmer about 20 minutes until vegetables are tender. Flake and deskin the haddock and add to the milk, potato and onion mixture. Add the peas and cooked Navy Beans and warm through a few minutes until the peas are cooked. Each portion should be served with a perfectly poached egg on top. Buying smoked Haddock in CA: It's just about impossible to find. I buy mine mail order from McKenzie. It's not cheap but the quality is superb. It is shipped fresh and each piece is individually sealed in its own wrapper, which makes it easy to freeze. My last 5lb shipment contained 8 large fish, each of which could probably feed two. Today was a bit of a Food Blogging Day. First I met with Derrick and his friend Tim. We spent about four hours together at the Fancy Food Show. . Unfortunately it looks like we missed bumping into Heidi who has already written a great report about some of her favourite vendors. Later this afternoon, Fred and I went to The Ferry Plaza. Who should we bump into at the Golden Gate Meat company? None other than Alder. About 10 minutes later, after we'd settled down for a glass of wine at the Ferry Plaza wine Merchants, we saw Kieca and her boyfriend, Matt, who we'd met at Vinography's first birthday party just a week ago. Tim, not Tom, though I do have a foodie friend named Tom as well, just to make it confusing. :) Good seeing you; we didn't get a chance to chat much at Vino Venue, so it was nice to chat more today. Tom is now Tim! Yes, Derrick - thank you so much for inviting me to join you, it was great to have company. I think I've eaten too much chocolate today. But I cant really complain about that, can I now...? Your recipe sounds great and your photos are fantastic! OK, you left out the important part. Where do the rest of us get undyed smoked haddock? Seriously, apart from Salmon, smoked fish is far too hard to find in California. I miss a good, cheap, qaulity piece of smoked mackerel that isn't in a can. Lovely food by the way - just the kind of thing I absolutely love. Owen - I updated the post to include the haddock mail order details. 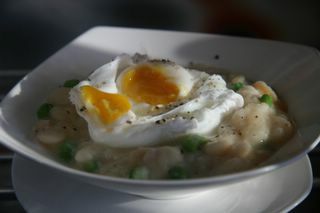 You make the meanest poached egg Sam! That looks gorgeous! This sounds great. I've never had poached eggs with beans and fish before, but I can just imagine how good it must taste. This is a must try. Thanks so much for sharing! Hi Sam - I've finally come around to see what you have! 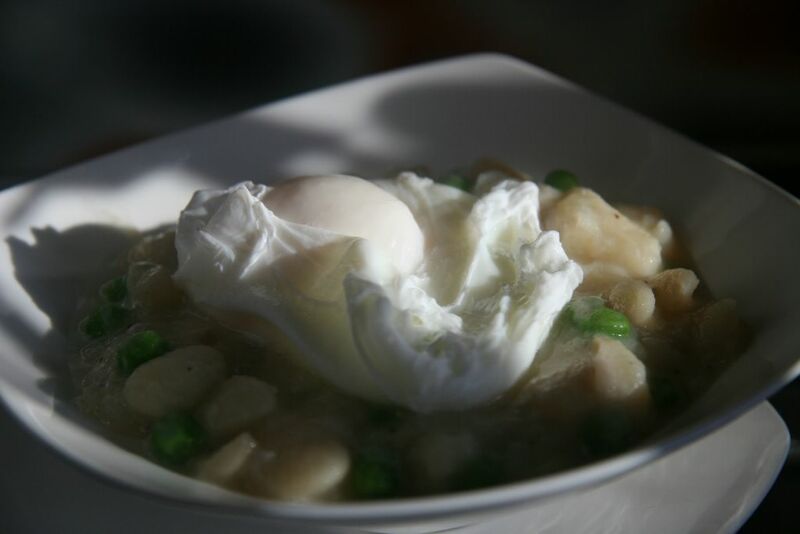 I've never attempted to poach an egg, but I gather it can be tricky - yours came out perfectly! Your N-BASH & PEGG is beautiful! Thanks so much for participating in IMBB 11! Ok, ok, I admit, I totally lucked out with the poached egg. I even forgot it for a few seconds, AND forgot to time it. Egg makes an absolutely perfect accompaniment to smoked haddock. I can't recommend this pairing highly enough. Apart from the classic kedgeree which contains this fish and hard boiled eggs, another favourite way form me to serve it would be poached on a bed of new boiled potatoes with steamed spinach, hollandaise or beurre blanc, and the poached egg balanced on top.